WCK GRC software provides holistic coverage for all your risk management challenges - security, IT, physical and critical infrastructure protection. Our governance risk and compliance platform delivers crystal clear visibility of your security and IT posture. In business language that management can understand. You get a remediation plan that is prioritized so that you focus your improvement efforts where it counts the most, on your company‘s crown jewels. Our unique GRC solution is designed to be implemented in an extremely short time frame. Simple and intuitive to use and maintain. WCK GRC software provides proactive risk management for enterprise customers in different market sectors such as: banking and finance, critical infrastructure, energy, telecom, manufacturing and government. The banking and financial industries are traditionally the strongest market sector for WCK, and make up approximately one third of WCK’s customer base. For a case study on how a European-based bank improved its security posture while decreasing its ongoing review and audits costs, go to WCK Banking Case Study. Industries like energy, oil and gas, utilities, transportation, healthcare and manufacturing systems need to assess and manage risk for both standard IT, as well as specialized systems such as control systems including SCADA, PLC, embedded systems, EID’s, and other operational elements. WCK GRC Software was designed from the start to seamlessly support the unique needs of risk management in non-standard environments and critical infrastructure, in addition to supporting standard IT systems. Organizations can holistically manage safety, physical security, OT and IT security functions as part of a comprehensive and integrated risk management process. There are several reasons why WCK is particularly suited to support the needs of Critical Infrastructure and control systems. These reasons include WCK’s unique asset-based approach which easily supports specialized assets and the software’s dynamic multiple policy support that is based on the asset type, the zones of the asset, and regulatory requirements. Industries such as Oil & Gas, Energy, Utilities, Telecommunications, Healthcare, Manufacturing and Transportation can reap benefits from risk management and decision support tools specializing in Critical Infrastructure Protection (CIP) and adapted for these domains. Specialized devices used for manufacturing, medical, etc. is simple and intuitive – as a result of the asset approach. Findings are easily correlated around assets, eliminating the time-consuming and complicated mapping per finding required by other solutions. As a result, collecting, correlating and analyzing risks from any type of external system is simple and intuitive. This ability is a must for the unique needs of critical infrastructure protection. The asset-based approach provides value for IT environments, but is of particular value for critical infrastructure protection, where the diversity of IT, non-standard systems and devices is high. WCK and its partners have developed blueprints for different vertical sectors (medical systems, water stations, etc.) which include each market’s unique assets and policies. Such blueprints can be used out of the box and significantly save time and human resources. One of the challenges of risk management for critical infrastructure is getting a clear understanding of how multiple, technical risks from diverse systems affect the business. WCK provides a wealth of customized dashboards, reports and analysis tools that enable management insight into risk and compliance for critical infrastructure protection. that model the complex dependencies between IT assets, non-standard systems, physical devices and logical assets that serve critical business processes. by tracing how risks propagate across organizational processes and complex environments. from multiple perspectives. WCK’s aggregated risk assessment is based not just on risk criticality, but also its business impact and the dependency analysis between business assets and the technical components that serve it. such as: safety, legal, brand, productivity, finance or whatever business parameter is important for your organization. This is especially relevant for critical infrastructure protection, where, for instance, there is a need to understand how cyber risk can affect safety. A manager can zoom in and find the root cause of a business process or service at risk, down to the specific technical risk finding. reduce the time and cost spent on senior and specialized consultants. by blending the right mix of controls from multiple policies. As a result, even less experienced consultants and employees are able to collect factual answers. WCK analyzes these answers and performs an automated risk assessment, further reducing the need for a higher level of expertise during much of the review life-cycle. The software automates many of the mundane, operational tasks of audit management and mitigation management. WCK includes workflows that automatically send emails, alerts and escalations. WCK risk analytics results in more efficient utilization of senior experts and consultants. Their valuable time can be used where it counts, to build the complex policies required for critical infrastructure security. and to study and expose hidden vulnerabilities. Organizations with complex environments cannot use a single, standard policy. They require multiple cyber and security policies. This is especially true for critical infrastructure organizations with non-standard systems. Other asset properties – outsourced, DMZ, cloud, any parameter needing a set of controls. is a must as it is often impossible to implement standard IT security solutions for non-standard assets. For example, if you can’t implement patch management in a production zone, then you need to strengthen your perimeter defense. Malicious attacks can target little-known vulnerabilities of non-standard assets such as centrifuge controllers, core routers, etc. Such attacks cannot be found by standard security solutions since their attacks lack known signatures and patterns. The only way to protect against such targeted attacks is to set specific, asset-driven security requirements (policies) that are driven from an understanding of the unique vulnerabilities of these specialized assets. But this knowledge is typically hard to find, and resides with only a small group of individuals. WCK’s asset –driven policy support enables capturing this know-how and attaching it to its relevant asset type. The software enables multiple policies that are customized for each asset and seamlessly enforced by the security teams of the organization. WCK GRC Software is a business-driven risk management software solution that allows the CIO, CISO, CRO and other company executives to improve their governance, risk and compliance processes. Most enterprises recognize that the risk and compliance process calls for automation. They understand that their existing office and spreadsheet solutions do not provide the management insight they need from the’ the large amount of findings collected from reviews, audits and automated tools. WCK both simplifies and enhances risk management by taking an innovative approach. The WCK Designer – allows users to visually draw the relationships between assets, or import them into the software. The result is far more than just a pretty picture! The picture represents a logical structure. The software analyzes the dependencies between the multiple business, technical and physical assets in the picture and uses these dependencies as part of its risk aggregation and analysis. WCK Dependency Maps - display how risks cascade across an organization between its assets and color codes the riskiest assets in shades of red. What are the benefits of the WCK Approach? How can your organization benefit from the asset–based approach to risk and compliance? The approach allows you to implement your GRC incrementally, step by step, without the need for large-scale modelling and customization. Get quick wins within weeks - The asset approach delivers rapid implementation. An initial risk and compliance posture based on legacy findings is ready within few weeks, without requiring complex risk and control mapping. More efficient risk assessment and management- based on built-in dependencies and risk analytics, smart aggregation and correlation of findings from multiple risk sources around common assets. Simple integration with complementary solutions - By correlating detailed findings around assets, it is not mandatory to map every technical finding to risks and controls. Importing legacy data and integrating with scanners, event management and more becomes a cinch. Minimal customization - A risk and compliance dashboard is ready for each asset type defined. The software is ready-to-go with no programming required. The purpose of Enterprise Security Intelligence (ESI) is to provide business risk-decision intelligence that can improve executive decision-making and enhance enterprise-wide security… and business results. An accurate risk posture based on legacy data can be presented within 1 – 2 weeks! 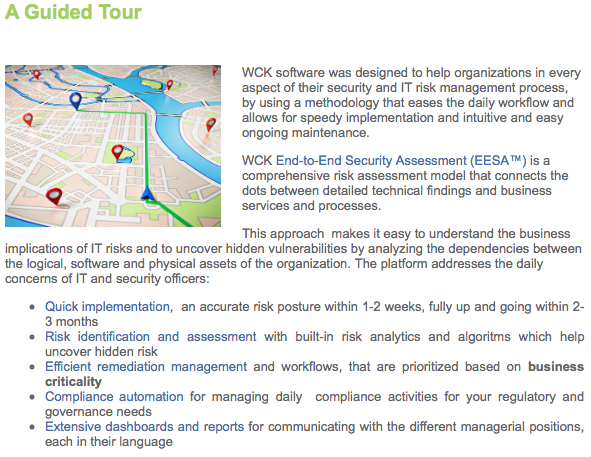 WCK is much more than just a documentation and database of security risks and findings. It provides automated and manual analysis tools that provide you with accurate security intelligence. The risk engine analyzes the huge amounts of data, correlates each finding to the relevant asset and then maps how the findings can influence IT, physical and logical assets across the organization. … as well as the organization’s overall risk posture from whatever perspective is relevant for you. WCK can automatically generate objective questionnaires that facilitate fact-based answers, rather than interpretations that differ based on the assessor. The policy-driven questionnaires are generated based on the risk engine’s analysis of the organization’s external regulatory and policy requirements, which are mapped to each IT asset and its unique characteristics. As a result, reviews are focused on the organization’s distinct needs, as opposed to using pre-defined ‘vanilla’ questionnaires. By providing ‘smart’ questionnaires, WCK helps reduce the need for highly-priced, skilled manpower. Mapping controls of new assets or policies to existing controls provides additional savings on the time and costs of redundant audits and streamlines compliance. The WCK platform implements End-To End Security Assessment (EESA™) to help organizations focus on business-oriented IT and security risk management. The intelligent risk engine classifies and filters risks, taking into account the business criticality of the assets. Dashboards and reports reflect the aggregated risks and how they affect business processes. The risk engine analyzes the interdependencies between business processes, organizational units and their supporting IT assets, in order to uncover hidden vulnerabilities and risks that can affect critical business processes. Intelligent aggregation and objective analysis of security intelligence and technical findings from a variety of online and offline sources, enable managers to make informed decisions and prioritize their remediation efforts on critical risks that affect the business. The root causes of risks can be identified and analyzed in three mouse clicks. WCK incident management correlates incidents that occur anywhere in your business with other security risk findings. If relevant, the correlated incidents are converted to remediation activities to be managed in the remediation workflow. WCK drives efficiency by streamlining the entire remediation process. Mitigation activities and investments are automatically prioritized based on business criticality, ensuring an effective remediation process. A built-in workflow triggers automatic alerts and email notifications to appropriate personnel for task assignments and escalations. Managers can track the status of open issues and drill down to view the details of each open ticket. Based on WCK enterprise security intelligence (ESI) capabilities, combined with the built-in risk analytics, organizations attain a holistic picture picture of their IT and security posture. User-friendly risk posture visualization, reports and customized dashboards for the different managerial positions enable officers and executives to clearly understand threats and their business implications at a glance. This holistic view of the cyber and IT security status promotes knowledgeable decisions regarding remediation activities and security investment priorities. Decision support, Key Performance Indicators (KPI) and trending tools provide management insight regarding risks, statuses and potential bottlenecks. The unique, business-driven assessment enables officers and managers to understand the business implications of risks and prioritize remediation activities and security investments accordingly. Executive-friendly dashboards and reports accurately reflect the organization’s risk exposure and the recommended remediation process in simple business language. An all-inclusive, easy-to-understand picture of the compliance status and comprehensive tools help organizations maintain a continuous compliance state. The platform provides officers and managers with aggregated risk and compliance status per regulation or policy. Decision support tools and Key Performance Indicators (KPI) provide management insight regarding compliance posture and help identify potential bottlenecks. The WCK GRC scalable platform includes multiple modules which can be mixed and matched depending on an organization’s needs. Companies can choose to start with the GRC Software’s basic functionality and then add on additional modules as their needs grow, or to start out from day one with the complete offering. 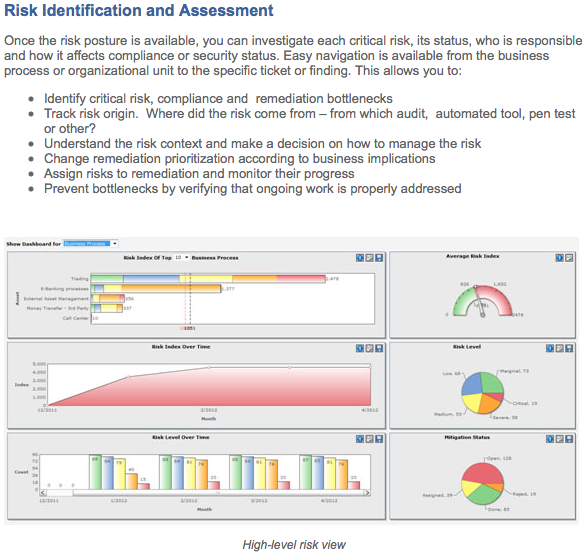 The Risk Management Module manages the life-cycle of your IT and security risk assessment. This includes: daily activities, reviews, audits, risk analysis and reporting on the overall risk status at any given point in time. The module aggregates information gathered from a variety of online and offline sources, such as human reviews and penetration tests as well as various scanners such as vulnerability, network application and code review scanners. 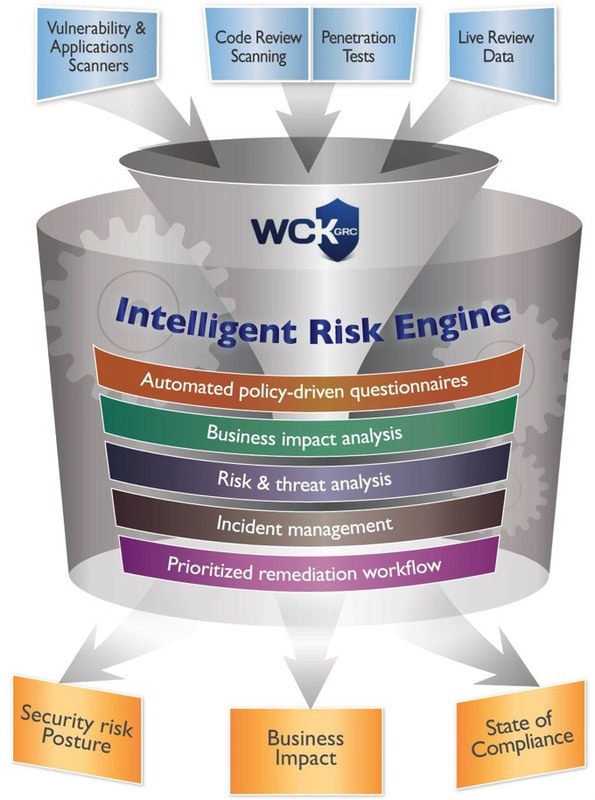 WCK’s intelligent risk engine performs an automated risk analysis based on business criticality. The Compliance Module simplifies the compliance process, whether when you need to comply with a single regulation or when multiple standards and policies are involved. Policy-driven questionnaires normalize controls across multiple regulations, standards and frameworks and facilitate objective, fact-based answers. 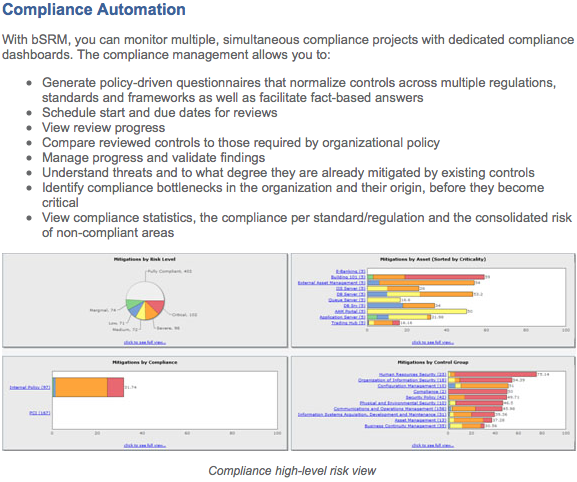 The compliance module visually highlights the gaps between the organization’s status and full compliance. 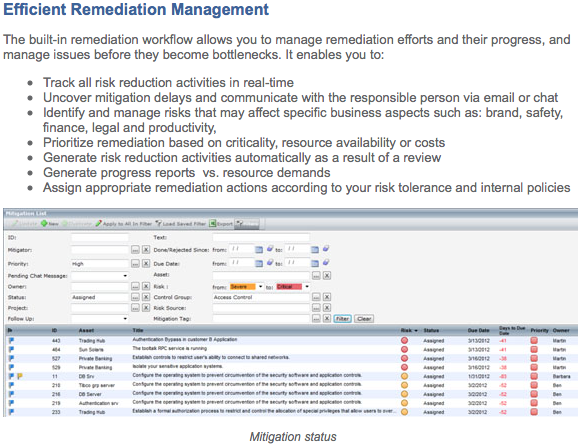 The Remediation Workflow Module manages the entire risk and compliance remediation process. The module generates an automated remediation plan that is prioritized based on business criticality and tracks the mitigation activities as well as their progress. The built-in workflow triggers automatic alerts and email notifications to appropriate personnel for task assignments and escalations. The Visual Asset Mapping Module is a powerful tool which allows organizations to graphically draw and easily correlate between all types of assets: business processes, organization units, IT systems, IT components, and other entities. Once these interdependencies are defined, the WCK system tracks how risks affect these correlated assets, which are handled as logical units. The combined Visual Asset Mapping Module and the Risk Management Module described above help users discover and manage hidden risks. The Dashboards and Reports Module provides a comprehensive selection of predefined and customizable dashboards, built-in reports and a powerful report generator, all of which deliver a holistic risk and compliance posture as well as its business implications. The Penetration Tests Module receives the results of penetration tests performed by internal or external consultants, which can be linked to relevant IT assets. The correlation of penetration test findings around each asset with findings from reviews, audits and automated scanners allow users to understand the full risk impact affecting each critical IT asset. WCK’s Advanced Policy Mapping Module simplifies compliance with multiple regulations and policies. Compliance and risk managers can easily highlight and map sections of textual documents to controls. Each highlighted section is color-coded automatically by the system to reflect its aggregated compliance status, which is continuously updated. Easy-to-use filters allow users to view the compliance status of a specific process, system, organizational unit or other asset. When organizations need to comply with a new standard or policy, that policy can be easily mapped to pre-existing controls, which are already connected with other policies, thereby removing redundant controls and eliminating the costs of overlapping reviews. As cyber risk increases, there is increasing regulatory pressure on companies to tightly manage, not just their own internal IT and security risk, but their vendors’ security risk. WCK’s Vendor Risk Management Module enables organizations to efficiently analyze and enforce the risk level of third-party suppliers, as well as to benchmark the compliance and risk posture between their multiple vendors. In the complex world of application security, finding security vulnerabilities as early as possible means less effort and money spent in later stages, once the product is in production. Sooner is better. That’s why many organizations focus their efforts on continuous security guidance throughout the development lifecycle, even before their applications are in production. The WCK Secure SDLC Module manages and enforces organizational security policy during all of the development stages of an application lifecycle. WCK GRC Software’s Review Scheduler Module enables organizations to plan and schedule their risk assessment activities as part of their daily risk management activities. The Review Scheduler work plan includes task prioritization and assessment scheduling based on the business and regulatory requirements of your organization. The Incident Management Module enables the entering of incidents into the system, either on-line from an event management solution or manually. The system links each incident to the relevant asset, and correlates it with other IT asset findings. WCK GRC performs intelligent consolidation and analysis of information from a variety of online and offline sources to deliver a holistic view of the company’s cyber and IT security status. WCK’s interfaces and adapters enable automated connectivity and information gathering from a wide range of scanners, CMDBs (Configuration Management Database), task management and other complementary products. The adaptors use standard protocols including XML, and Web services and can interface with proprietary APIs if needed. Adding interfaces to new applications and products can be done within days. WCK GRC Software automatically generates objective questionnaires that facilitate fact-based answers rather than informed interpretations, which reduces the need for highly-priced, skilled manpower. The policy-driven questionnaires are generated based on analyzing the organization’s policy and compliance requirements and on the IT asset characteristics, such as: type, location, etc. As a result, reviews are focused on the organization’s distinct needs as opposed to the outdated approach of using pre-defined ‘vanilla’ questionnaires. WCK GRC Software supports a broad range of out-of-the-box control metadata, relating to the standards and best practices in IT, security and embedded systems. The platform incorporates, among other things: ISO, NIST, FISMA, PCI, CobIT, HIPPA, SOX IT controls and NERC metadata, and maps between controls, threats and vulnerabilities. The platform correlates and normalizes controls across multiple regulations and standards, enabling an organization to test once and comply multiple times, which substantially reduces the time and cost involved in reviewing redundant controls. bSRM automatically calculates, normalizes and aggregates the risk rating of each asset, as well as the organization’s overall risk posture. The intelligent risk engine uses unique algorithms, which consider the business criticality and the interdependencies between business processes, organizational units as well as IT assets and components, in order to expose hidden risks and overlooked security gaps. The platform supports the CVSS (Common Vulnerability Scoring System) scoring in addition to system-generated risk rating. bSRM drives efficiency by streamlining the entire remediation process. Mitigation activities and investments are automatically prioritized based on business criticality, ensuring an effective remediation process. A built-in workflow triggers automatic alerts and email notifications to appropriate personnel for task assignments and escalations. Managers can track the status of open issues and drill-down to view the details of each open ticket. Our user-friendly visual asset mapping tool allows organizations to easily define interdependencies between business processes, organizational units, IT systems, IT components and other entities. The tool facilitates a more accurate understanding of the risk landscape and the interdependencies. Assets that may seem less important on their own are often found to significantly affect more critical assets when viewed within the dependencies framework and the business process perspective. bSRM provides a simple 3-click root cause analysis for immediate investigation of risky business processes and highlights the remediation and compliance status. Quick and easy navigation from the business process view to the specific finding level (the ticket) is enabled within few clicks. Dashboards, built-in reports and a powerful report generator reflect the holistic risk posture and its business implications at a glance as well as the compliance status. Customizable dashboards can be tailored to suit executive and operational levels. Decision support, Key Performance Indicators (KPI) and trending tools provide management insight regarding risks, their status and potential bottlenecks. bSRM includes easy-to-use tools and adaptors for configuration and integration with complementary systems such as: scanners, CMDB’s, and task management software and offers an easy upload of findings from previous reviews via spreadsheets. These tools enable organizations to be up and running within weeks and reduce the costs of implementation. An accurate risk posture can be presented within days of installation. The WCK platform was designed to focus organizations on business-oriented IT and security risk management. Assets are classified based on five business parameters: financial, safety, brand, productivity and legal. The system generates context-based questionnaires to assess the business and security criticality of each asset. Analysis tools enable extended filtering of the risks based on business drivers. 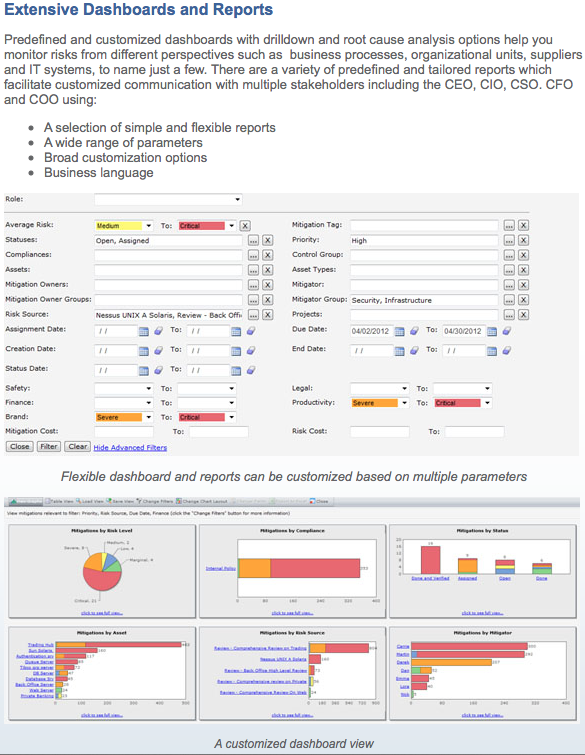 Dashboards and reports reflect the aggregated risk affecting business processes. 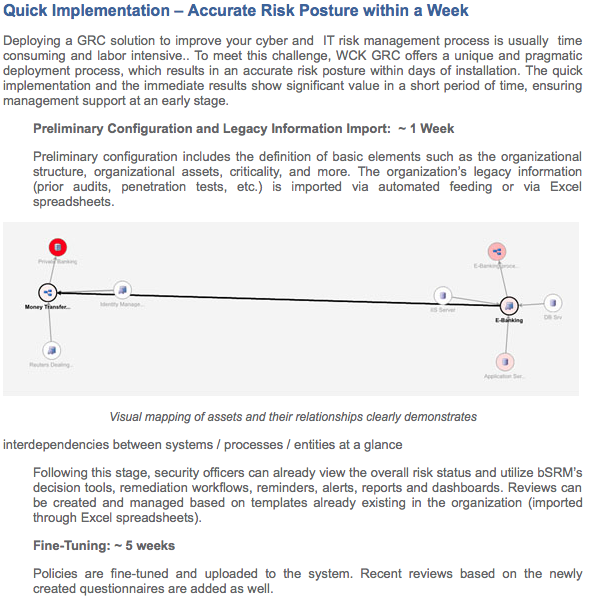 WCK GRC simplifies security risk management and compliance. Intelligent aggregation and analysis of findings from various online and offline sources deliver a holistic view of the cyber and IT security status. User-friendly risk posture visualization, reports and customized dashboards enable security officers and executives to clearly understand the threats and their business implications at a glance. All-inclusive and clear risk presentation promotes knowledgeable decisions regarding remediation activities and security investment priorities. WCK’s cost-effective mitigation management and prioritization promote smarter investments of the company’s resources focusing on business needs. WCK’s Intelligent Risk Engine performs end-to-end analysis of interdependencies among IT components, business processes, threats and controls. By identifying loopholes and uncovering hidden vulnerabilities, this unique analysis uncovers hidden risks and helps block malicious activities before they occur, which reduces the organization’s exposure. WCK GRC was designed to analyze and manage the threats and risks affecting critical infrastructure including embedded systems, SCADA components and other operational elements. The platform provides holistic security coverage of cyber, physical and embedded system risks for critical infrastructure sectors such as utilities, energy, chemical, oil, gas and transportation. Typically, organizations manage physical security and IT security functions separately. Physical access to critical facilities can pose additional critical security risks that should be managed alongside other security risks. WCK’s holistic security offers integrated risk management that incorporates risk assessment of IT and cyber security, embedded systems and physical security. WCK’s business-driven, cyber and IT security risk management promotes significant time and cost savings as well as a quick return on investment. Continuous process improvement is achieved via daily monitoring of risks, operations, processes and reviews. Flexible and scalable business models are available for medium and large organizations as well as smaller business customers. They include a perpetual license model, an operational leasing (pay-as-you-go) model and a cloud-based (SaaS) offering.